The Fundi Driveby: What about the STAR, and the three wise men? What about the STAR, and the three wise men? We've all seen the Christmas creches depicting three wise men who came from afar to bring gifts and pay homage to the newborn King of the Jews - is that merely tradition, or did it really happen? 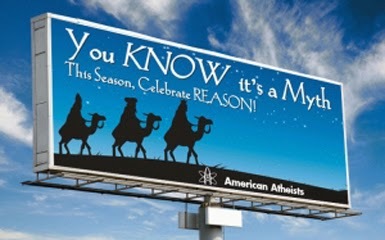 What do you say to those who deny the historical Jesus, (though many extra, and often hostile characters affirmed His existence) and the atheist billboards popping up all over the US that claim the Christmas story is a myth? Is there any evidence that Historical event took place or is it a myth? According to scripture, these visitors came from the East, having seen the Star announcing the birth of the King of the Jews. Where is he that is born King of the Jews? for we saw his star in the east, and are come to worship him." They were described only as 'wise men.' These wise men were astrologers because the only cause that beckoned them to go on this journey was this once in a lifetime celestial event, and they determined it to be a celestial announcement of the birth of an extraordinary person who was to be, King of the Jews. This is *reason* enough to also call them ambassadors, and as such they represented a kingdom(s), but does not necessarily mean they themselves were three kings. We aren't told where they began their journey or how long it took them to prepare for the trip. We do know that east of Bethlehem there are vast stretches of desert wilderness requiring much thought and preparation for such an endeavor. The greatest kingdom nearest them to the east was Persia, and we know that the Persians (modern day Iran) employed many astrologers, so it is *reasonable* to assume that is where their journey began or whether men from other kingdoms accompanied the wise men. So why is the tradition of only three wise men celebrated? Could it be that is because there are specifically three gifts mentioned? That stands to *reason,* doesn't it? (Matthew 2:11) And they came into the house and saw the young child with Mary his mother; and they fell down and worshipped him; and opening their treasures they offered unto him gifts, gold and frankincense and myrrh. A well supplied caravan had to be assembled, accounting for a round trip of great distance. *Reason* says this could take many months, from start to finish. Caravans carried wealth, and *reason* says that is especially so when the purpose of the journey is to visit a king. This meant a caravan bearing great wealth in addition to the other provisions, as the record specifically states that they brought "treasures." Treasures are something thieves and highway men would be interested in, and only three men on camels would be easy prey, so *reason* demands that the caravan carried it's own armed protection which may have included an entourage of at least a dozen or more men. So now you're probably wondering about the celestial event itself. What evidence is there that could possibly be that could fit the Biblical account. Interestingly, there are nine facts found in the book of Matthew concerning the Star of Bethlehem. Is there any way the confluence of Matthews grouping be confirmed or denied through astronomy? For me to write it out would be a book, and one already has been written that accounts for all nine of Matthew's statements, and a video of it has also been made. If your interest is genuine, I would ask you to view this you tube video by the author of that book.